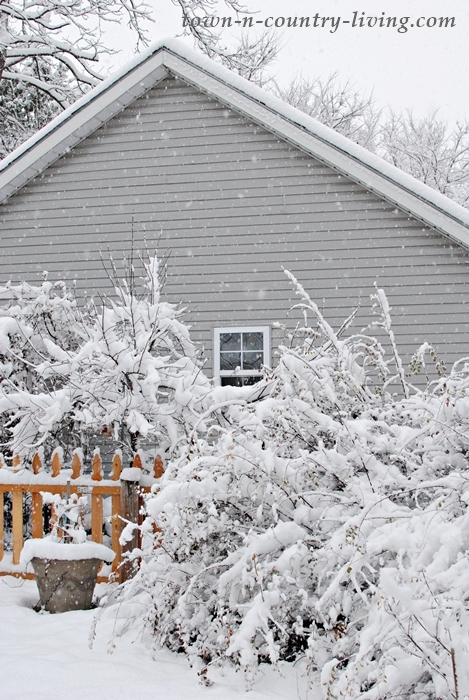 Old Man Winter gifted our neighborhood with almost a foot of snow yesterday. The mini blizzard created an opportune moment for staying indoors and adding a bit more holiday decor to the rest of the house. 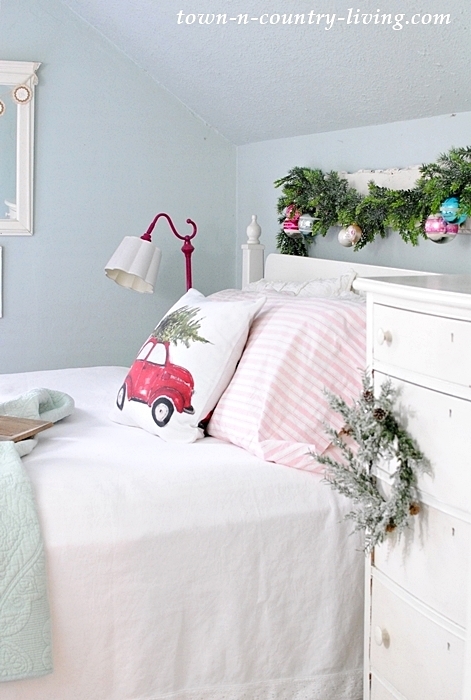 My Christmas Home Tour was shared last week but I didn’t include a Christmas bedroom, so today I’m sharing one of our under-the-eaves bedrooms. My daughters slept in here when they were much younger, but there were two twin beds as opposed to a single Queen bed. Now they’re all grown up with children of their own. And those children sometimes sleep in this room when they come to visit. 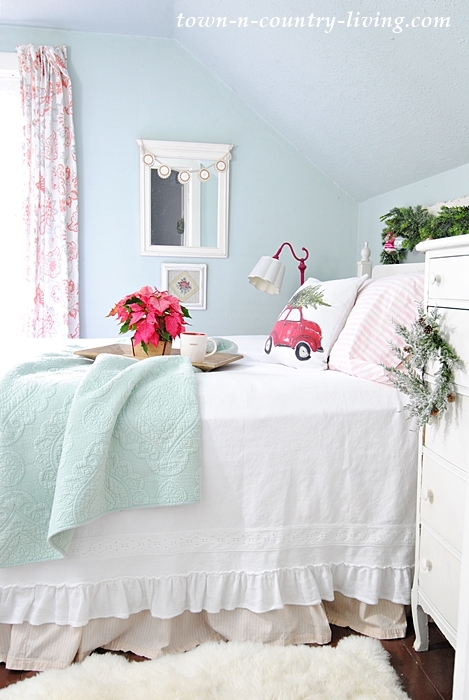 A ruffled white coverlet is reminiscent of a snow-covered landscape. New red and white sheets remind me of pinstriped Christmas candy from childhood. I found both the coverlet and sheets at Home Goods. 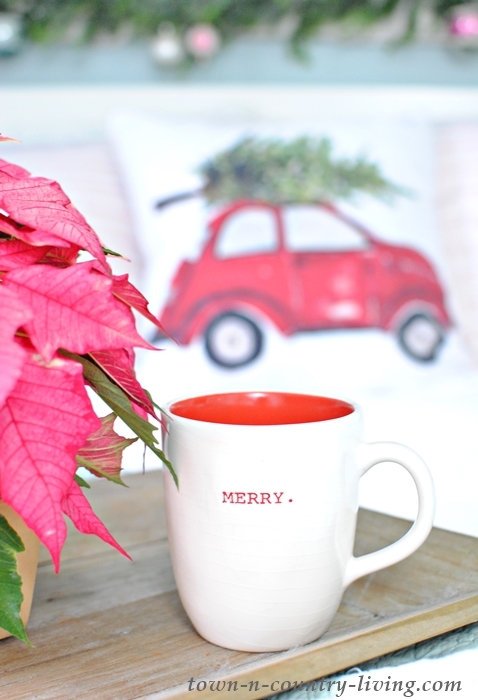 My favorite Christmas mug for coffee or hot chocolate has a simple holiday message. Merry. 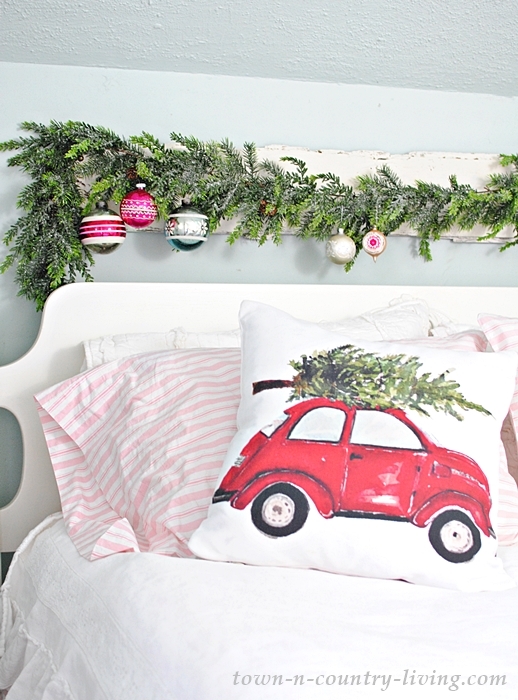 My favorite Christmas pillow designed by Lucy at Craftberry Bush takes center stage on the bed. 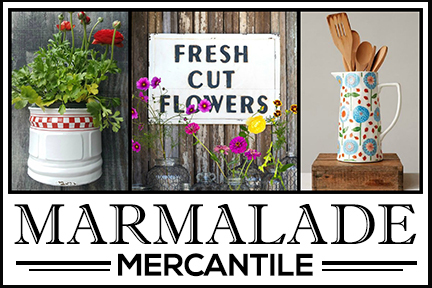 Garland drapes over a painted farm board while vintage ornaments add a little bit of color. Is it possible to have too many vintage Christmas ornaments? I don’t think so. 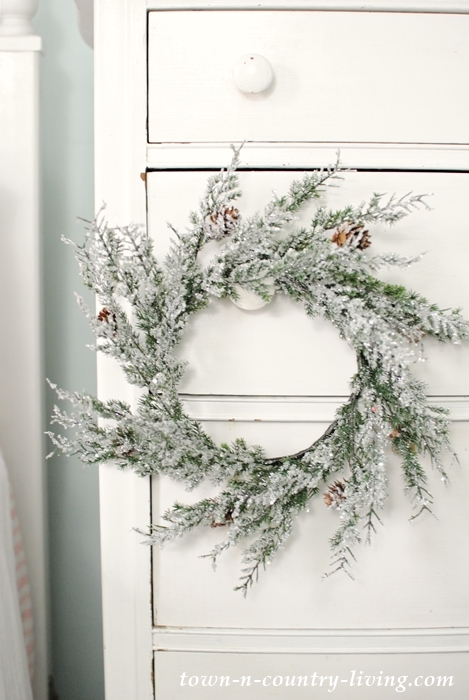 Several of these frosty wreaths decorate my house. 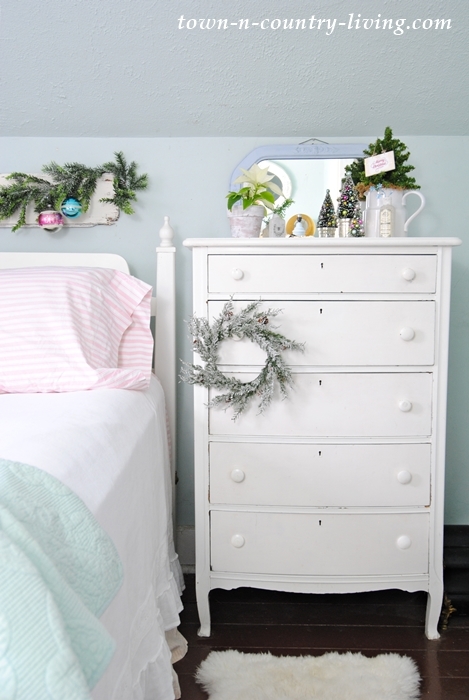 Most are hanging in windows, but this one graces the dresser to create a Christmas bedroom. 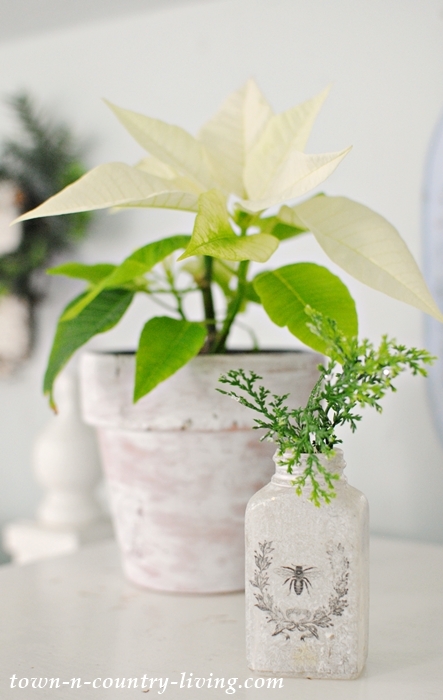 One of the easiest ways to decorate for Christmas is to add poinsettias. You’ll find them throughout my home during the holidays. 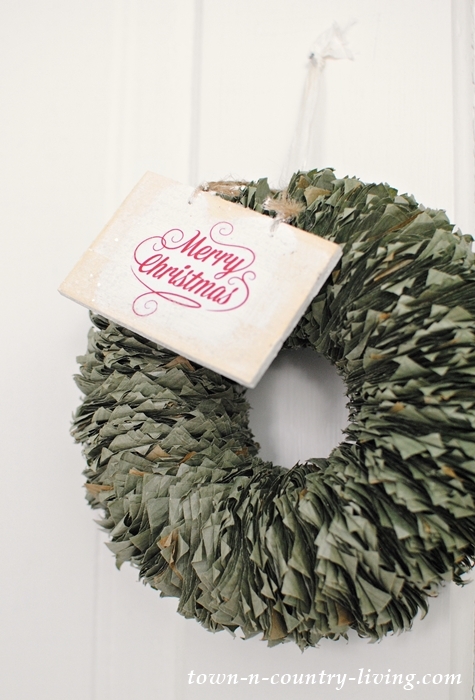 And on the door, a charming paper wreath creates Christmas cheer. 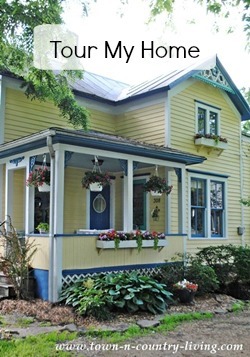 The paper was dyed and formed into shape by Rosemary at Villabarnes. I added one of my handmade wooden Christmas ornaments. 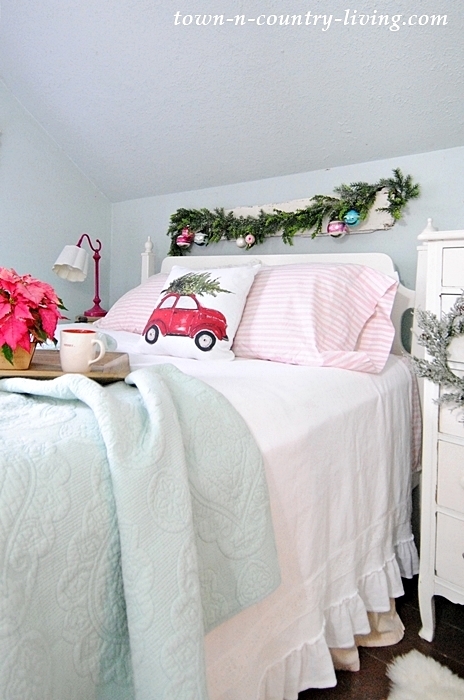 Just a few holiday accents to create a Christmas bedroom. Oh, and Old Man Winter? This is the early Christmas present he left. 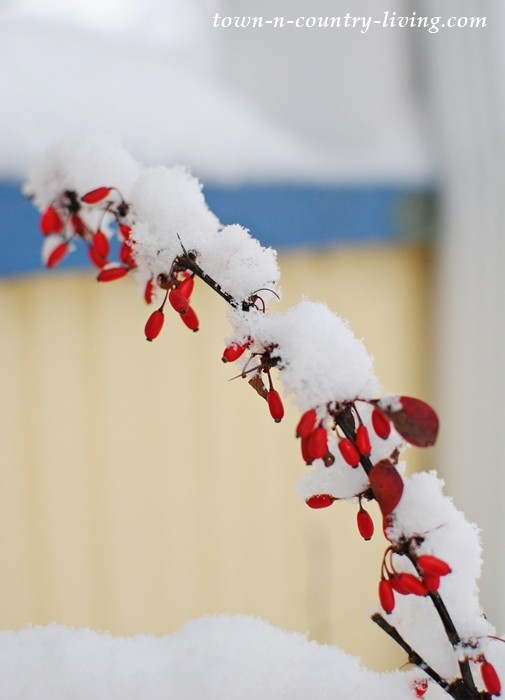 I love the snow on our barberry bush. 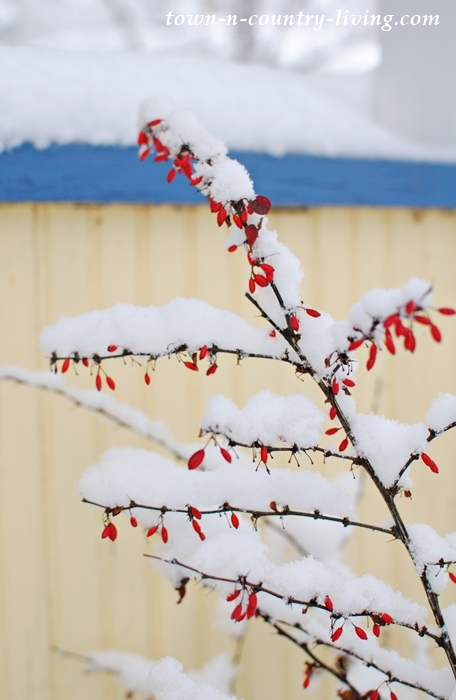 The contrast of the little red berries against the snow is so pretty. 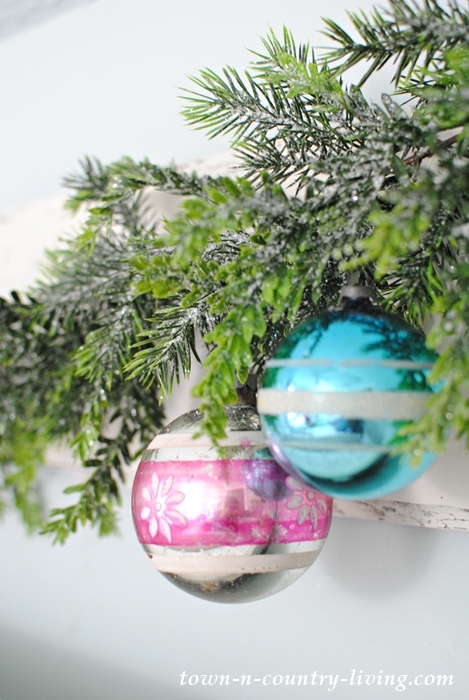 How’s your Christmas decorating coming along? Are you finished or still working on it? The snow on those bushes are beautiful. Would make a great piece of art for winter! I’m still working on my Christmas decor. It’s coming along. Yours is beautiful and very creative. 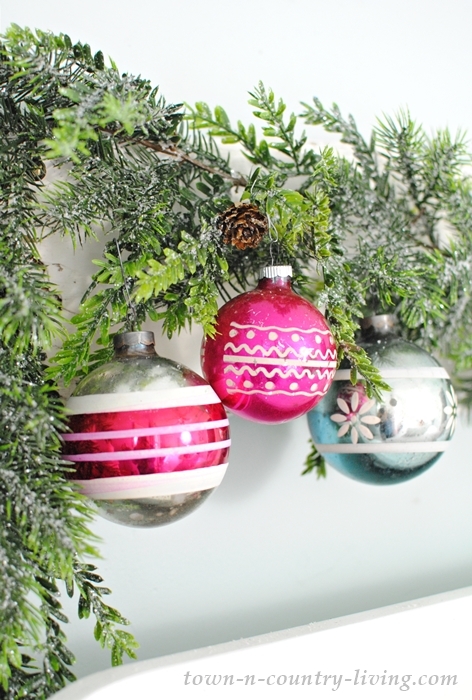 I love the vintage ornaments! 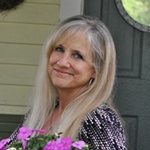 It was beautiful seeing all that soft white snow around your lovely home nearing Christmas – I lived in nearby Downers Grove for many years and am now in the Pacific Northwest where we have rain instead….I always look forward to your articles and pictures. Merry Christmas! 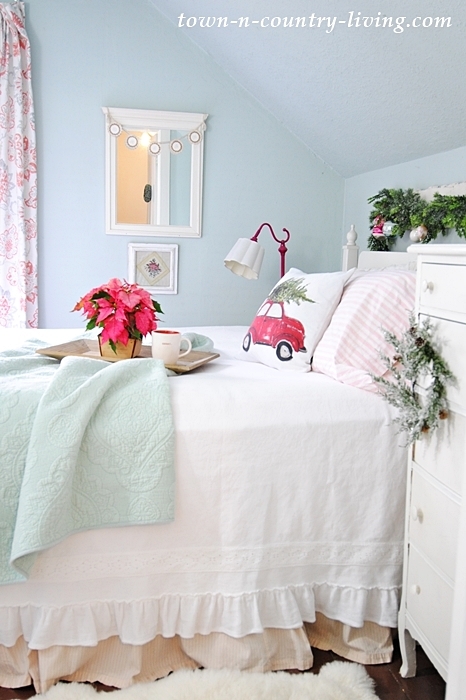 Such a cute and cozy bedroom, Jennifer. Love the vintage touches and pops of red. So beautiful, Jennifer! Thanks for the shout out on the paper wreath. 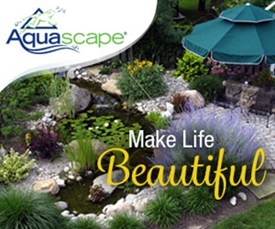 I just love seeing where my creations end up. Have a great Christmas!